In the past, federal law required most employees to be paid time and a half, or 1.5 times their regular pay rate, for each hour of work per week beyond 40 hours. The rule protects workers who lack control over their time and tasks and do not receive high pay. Professional and managerial employees, on the other hand, are exempted from overtime pay requirements if they satisfy certain “duties tests” and make more than a threshold salary. Unfortunately, the salary threshold for exemption has eroded over time and has fallen to a level—$455 per week—that is currently less than the poverty threshold for a family of four. As a result, millions of workers work long hours without fair compensation. 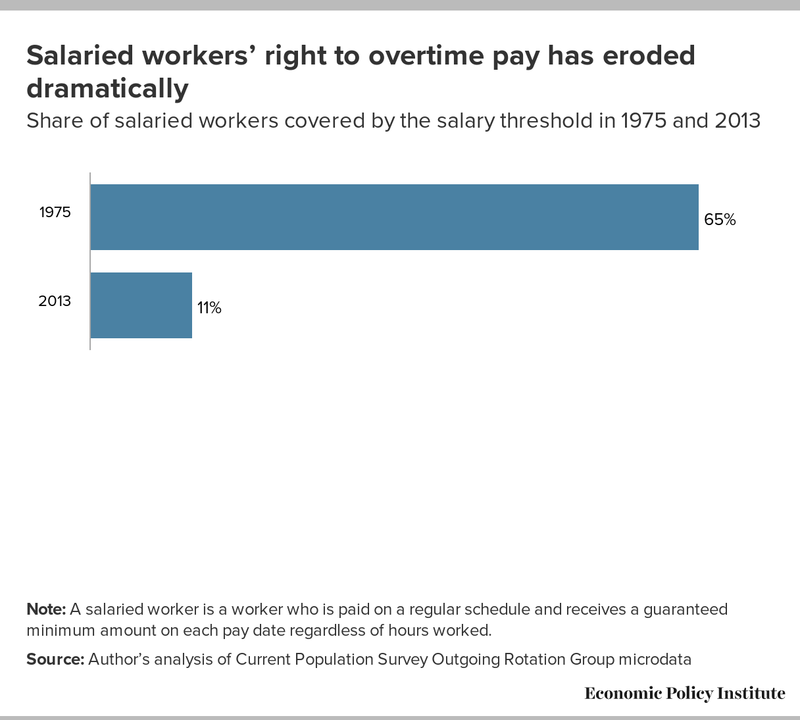 In 1975, nearly two-thirds of salaried workers (65 percent) were covered by overtime protections based on their earnings alone. The real value of the exemption threshold has dropped so dramatically that in 2013, just 11 percent of salaried workers were under the threshold. To cover the same 65 percent share of workers as was covered in 1975, the overtime salary threshold would have to be $1,327 per week. Even after accounting for the economy’s shift toward higher-level white collar professional and managerial jobs that require higher levels of education, the threshold would have to be set at $1,122 per week. The figure shows the share of workers who were covered by overtime protections in 1975 compared to the share covered by overtime protections under current law. When the Department of Labor updates the overtime rules later this year, it should set the threshold for overtime at no less than $1,122 per week, which would make it consistent with the 1975 benchmark, even after accounting for the shift toward higher-level white collar professional and managerial jobs that has occurred since that time. See the new EPI feature Why It’s Time to Update Overtime Pay Rules: Frequently Asked Questions for a comprehensive overview of the issue and answers to key questions, including who’s eligible for overtime pay, why the current rules are outdated, how they can be updated, who would benefit from these changes, and what economic effects these changes could have.